My favorite book is The Sun Also Rises by Ernest Hemingway. There’s beautiful language, it’s concise and moving and it’s important from a literary standpoint, but that’s not why I love it. In the book, the fictional character Jake Barnes, because of injuries sustained in war, cannot be in a physical relationship with a woman, despite being in love with one. When I first read the book, in my freshman year of undergraduate school at Syracuse University, I was immediately taken aback by what type of modesty and openness would propel a man to write something that many men would spend a lifetime trying to avoid the mere suggestion of. There are many causes for insecurity among men, and we all deal with them in different ways, but few seem as harsh as the one described by Barnes. What I loved most about the book was the honesty, even if it were fiction. It seems that some of the most honest writing is. I think that to admire a quality without trying to emulate it constitutes some type of cowardice or hypocricy, so here goes. I was on the train into Boston yesterday, working toward a Directed Study that would function in the capacity of a repeated Catch a Cure project, in Texas this time, and I was trying to post something on Facebook in commemoration of my father’s passing on that day, two years prior. I just started crying. There have been plenty of times, his birthday, Father’s Day, talking to my mother, when I’ve swallowed those tears but the well where I put them must be full. I just miss him, I guess. Emotion isn’t typically terribly complicated. When I was 24-years old I slept in the back of my Jeep Wrangler at the time for 200 nights, to fish my way across the country. I lost 42 pounds. Some nights, toward the end of that trip, were brutally cold, and I mean like 20-below, Ketchum-Idaho cold. I’d shiver myself awake in the night to blast the heat and fall back asleep. Since I was about 18 I’ve been covering myself in tattoos that I hope act as some means of telling my story even if I’m too quiet to. Some were smaller and took less than an hour, but others took three-plus hours and the needle lingered on the skin that barely covers the bone. When my father passed, I flew home from Boston, stood in front of a crowded church, and did my best to eulogize the man I loved. I say all of this to suggest that tears aren’t an easy thing to extract from me, by any means. I could count the times I’ve cried in the past decade on one hand, with fingers to spare. And I was very hesitant to write this, but two notions gave me some solace. First, I am fairly certain that only a few human beings actually lay eyes on these words, and most of them know me well enough to know these things about me anyway. Secondly, I thought: perhaps, and more than likely, there are others out there feeling this too, going through what I’m going through, and what purpose does it serve for us all to smile and hide our pain so that we might, on the face of the matter, all seem to be utterly alone in how we feel? Two years ago yesterday I was on a plane back to Boston, having visited my father for the last time, when my mother called to tell me he’d passed, and yesterday at that same time I was on a train into the city. It’s pure coincidence that I was aboard public transport both days, but I find the circumstance strangely fitting. On a train, or a plane for that matter, you both are, and are not, moving. You might be said to be sitting still while speeding over land at dozens, or hundreds of miles per hour. And losing a parent, as many of you might know, feels oddly similar. I know it has been two years since I’ve held my father’s hand, heard him speak or tried to make him laugh. I know that time has moved, and me with it. But, like on a train, it does not feel as though I’ve moved away from the son who would call every night to exchange casual pleasantries and assurances that I am okay, along with questions about his well-being. I remember the first thing I did when I’d heard that he’d passed: I tried to call his cell phone. He was a nervous guy, and because he was constantly afraid of losing potential business as a criminal defense attorney, he’d answer his phone no matter the time of day or night, without fail. It just rang. And rang. I was 27. I’ve undertaken a battle against melanoma, the cancer that took his life, and absolutely everyone who has shared my content, purchased a T-shirt, donated a product or given a dollar has meant more to me than I can express. It feels like I am fighting back against the evil that did so much harm to my family’s life. It is not happiness, but it is some solace. So when I thought about sharing this, I heard the voices of those who might potentially respond, and I’ve heard them aloud. “Nobody wants to read about cancer.” “Death is depressing, move forward, find happiness…” And I’m trying. Friends here at Emerson in Boston, friends from back home in New York, and so many anglers in Florida have made that so much easier for me than it might have been otherwise. But I thought that perhaps out there there might be one other person, going through something similar, something equally painful, if not more so. 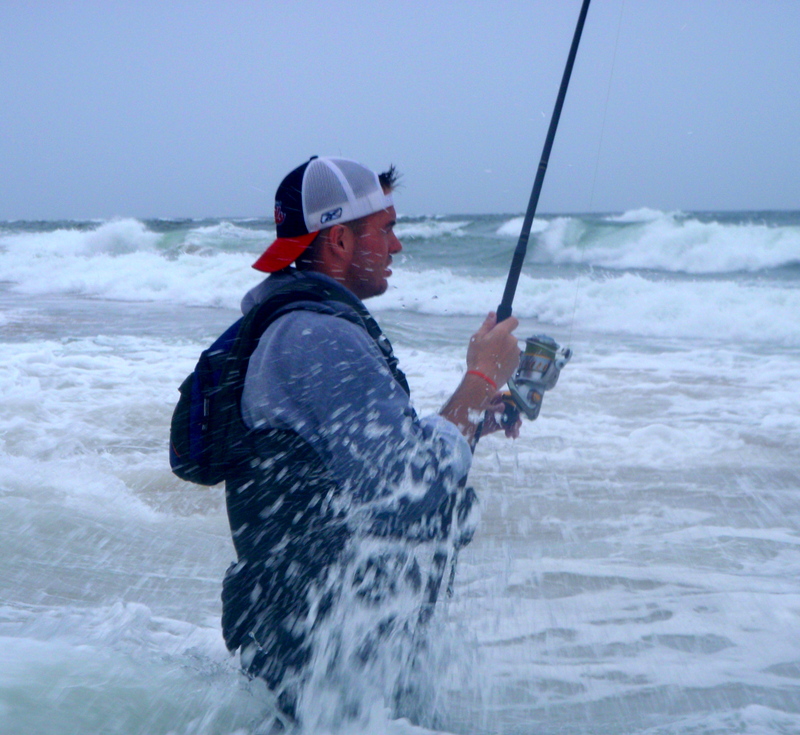 Fishing Montauk’s coast during the Fall Run. Those words aren’t mine, they were spoken by Hemingway eulogizing a friend, Gene Van Guilder, although many suspect he was talking as much about his future self as his lost friend. To many, the Fall symbolizes a death of something pure and beautiful like summer, but for outdoorsmen, it’s more. Autumn is motion. While walking our golden retriever in the Fall in Upstate New York, my father always kept an eye skyward for migrating geese, he’d point them out, and perhaps utter a word or two, nothing more than sheer amazement at the pure beauty of it. I was lucky to meet a fellow striper fisherman while studying at Syracuse University, Curt Dircks, and we began a Fall tradition of fishing Fire Island, where his family has a camp, every October and sometimes even into November. It’s hard to believe it has been ten years since that tradition began, but we haven’t missed an Autumn. I was a triple-major at Syracuse, and working two part-time jobs, so the escape to a remote barrier island was a relief and then some. The Island doesn’t allow motor vehicles, so every October we pack our gear, the necessary groceries, rods, waders and bucktails and hop the ferry to the thin barrier island south of Long Island. Sometimes I was taking a break from editing the magazine I worked for, sometimes I was up visiting from where I lived in Florida and now I drive from my adopted home of Boston, but there’s always the bass to come back to, there’s always motion. As I sit on my small deck in my adopted home on the North Shore, I watch those same geese unsettle themselves for a southward journey as the sky’s light seems to become more crisp in the cooler evenings. I can’t help but think of my dad. I talk with my friend, neither of us can believe it’s been a decade, and we plan this year’s attempt to take part in the Fall Run, hammer out some tentative dates, swap pictures from years past, and dream ever so carefully about the fish stirring along the Southern Coast. A fisherman’s dream uttered aloud becomes a curse. To me, Autumn is motion, and of the most beautiful sort. Often in life it behooves to step back and look at our circumstance with some perspective to better handle it. Move away from the calendar and see it for what it is, and you’ll notice we’re moving toward summer again, we’re moving already. Often in life there are moments, years even, full of hardship and pain, that simply must be dealt with. “The only way out is through.” But if we have faith that those times will pass and we’ll bask in the comfort of summer’s warmth again, then the winter is only a period to be weathered, not feared. And so, with some perspective, the Autumn is motion toward summer again, and it’s damn beautiful motion at that. The crisp sharp leaves of light in the morning, the geese overhead, the stripers schooling along the coast and then those days when you’re outside and the air is just perfect, as though it were made to soak your skin in comfort. Stagnation is the only thing to be feared, and motion, and the form it takes in Autumn, is pure beauty.